Acker Heating & Cooling is dedicated to providing the best possible HVAC solution for your home or business. You can count on us to provide you with a HVAC system or solution that fits your unique needs. Over the many years we’ve spent installing HVAC systems for greater Athens area homeowners, we’ve earned a reputation for doing the job right the first time, and we’d love to deliver the same great service to you as well! As licensed HVAC contractors and specialists, we have the tools, the equipment, and the experience to keep your equipment running smoothly all year long. Whether it’s a new HAVC installation or emergency service, we are available to assist you! We also offer service agreements to keep your HVAC system running at peak performance year-round. Bryan Acker and his team has provided excellent HVAC services for my home and rental properties. I give them 5 Stars for their fast service and workmanship. I have worked with Bryan and his team on three complete systems installed in my last three home renovations. They pay attention to detail and deliver on time. I have been using Acker Heating & Cooling for over 20 years. They are fantastic! Very reasonably priced. They come quickly when you call them. They are always friendly and professional. Here at Acker Heating & Cooling we have a rich history of helping homes, businesses, and individuals with their HVAC repairs and new system installation projects. As a local and family owned HVAC company, we’re passionate about serving other local families and neighbors with both professionalism and care. Our technicians and staff are a dedicated group of individuals, working together as a team to ensure quality work and customer satisfaction. As a Bryant dealer, with a wide variety of HVAC products to choose from, we can keep your family healthy and feeling comfortable all year long. We carry a complete line of indoor HVAC equipment with innovations that raise the standards of comfort and reliability. These products include air conditioners, heat pumps, gas furnaces, programmable thermostats, humidifiers, ductless split systems, air cleaners, ultra violet lights, ventilators and zoning products. Let the HVAC experts at Acker Heating & Cooling Inc help you customize a solution that’s right for you! There are many areas Acker services, and we cater our products to many different communities. Take a look below to see if your areas in our service range. Most systems have a lifetime of 10 to 20 years. As your equipment gets older, it’s efficiency can decrease dramatically. You may notice that it gets noisier and needs repairs more often. When an unit begins to show it’s age, you have two choices. You can overhaul the system or replace it. Because technologies improve over time, a new system designed with newer, more energy-efficient equipment makes sense, especially if your system is 10 or more years old. We can estimate the cost of a new system as well as a payback schedule that will show you how newer technology will pay you back in lower energy usage. Will Replacing an outdoor unit make it more efficient? Will a bigger sized HVAC system perform better? An HVAC unit that is too big for your home will have short run cycles. It may take only a short time to cool the air, but the unit shuts off before enough air blows across the indoor coil where moisture condenses into water and drains from your system. Too much moisture left in the air can lead to mold and mildew problems. Why is a HVAC system with matched components so important? A matched HVAC system is important for a variety of reasons. One is comfort. When all your components are properly sized to your home, you can control exactly how much heating or cooling you need so you can relax. 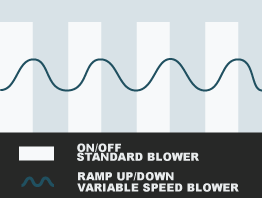 Also, a properly sized matched system enables every component to perform as designed, meaning proper cycle times are maintained, humidity is controlled, and system sound is minimized. At the risk of telling you something you’re tired of hearing, replace the air filter in your system on a regular basis. Dirty air filters reduce the amount of air flowing through a system and make the furnace work harder to maintain the temperature. How often you change the filter depends on the type of filter you use, if you have pets, and the size of your equipment. Please give us a call and we can give you proper guidance. 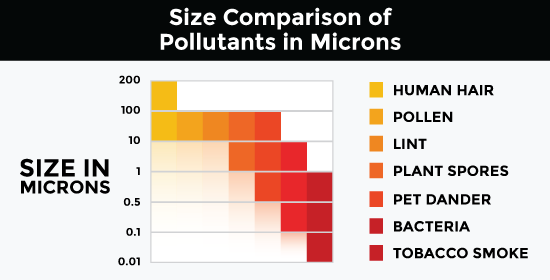 Proper air filtration is just as important to the health of your system as it is to the health of your family. Without proper filtration, dust and dirt can build up on your system which impacts operation and efficiency. A high-efficiency filter will remove more dust, dirt, pollen, mold, and other particles from the air. If you suffer from allergies or other respiratory problems, you should strongly consider a high-efficiency filter. No matter what type of filter you have, make sure you change it regularly. Yes. Keeping your system properly maintained will lower energy and repair costs, prevent breakdowns, and prolong the life of your equipment. Neglecting necessary maintenance ensures a steady decline in equipment performance while energy use steadily increases. Today’s new high-efficiency systems can save up to 50% in operating costs over a ten-year-old furnace. Many 1990 and earlier model furnaces have Annual Fuel Utilization Efficiency (AFUE) ratings of 65% or less. The minimum AFUE rated furnace that can be sold in the United States as of May 1, 2013 is 80% in southern states and 90% in northern states. Upgrade to a high-efficiency air conditioner – Swapping your old, inefficient air conditioning system for a high-efficiency HVAC system can cut electricity bills by one-third. Consult one of our professional technicians to ensure your system is the right size for your home, and you aren’t over- or under-cooling for your space needs. Upgrade to a high-efficiency furnace — New high-efficiency furnaces use up to 50% less fuel than an older HVAC system. It can save you up to 25 percent of your home-heating costs in one year, and within a few years, you’ll have recovered the initial cost of replacing/upgrading your furnace. Choosing a model with an energy efficient motor can save 20 to 50 percent of the energy needed to continuously operate a fan motor. Let us show you the advantages of replacing your old furnace today. The average home spends about $1,900 annually on energy bills. HVAC systems accounts for as much as half of a home’s energy use. The EPA provides important recommendations for energy-efficient equipment, including proper sizing, quality installation and maintenance, and other home improvement considerations to help you get the most out of the heating and cooling products you purchase, save energy, and save as much as 20% annually on your total energy costs. What If My Air Conditioner is not cooling? My Heat Pump has not cooling, what does that mean? No heat is coming from my gas furnace, what's wrong? Heat pumps are a very efficient alternative to electric heat. A heat pump system works the same as an air conditioner in the summer, but it runs in reverse in the winter to heat your home. The system will be matched with a backup heating source, most often electric heat for those extremely cold days of winter. With a traditional HVAC system, if you wanted to save more, you had to use less. But a Hybrid Heat system combines the benefits of intelligent control for both gas and electric heating to create an intuitive system that can actually react to changing conditions. 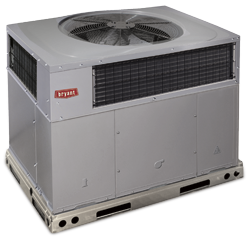 A heat pump HVAC system would have two different sized compressors, a small and a large one. The compressor that is used at a given time would depend upon the need. If only a small amount of heating is necessary, the smaller compressor would be used to save energy. The large compressor would only be used when a large amount of heating was needed. How do I select a HVAC system? Split Systems are the most typical type of heating and cooling system. The Hybrid Heat system differs from a traditional split system by replacing the air conditioner with a heat pump. Heat pumps cool your home on hot days and provide efficient heating in moderate temperatures. 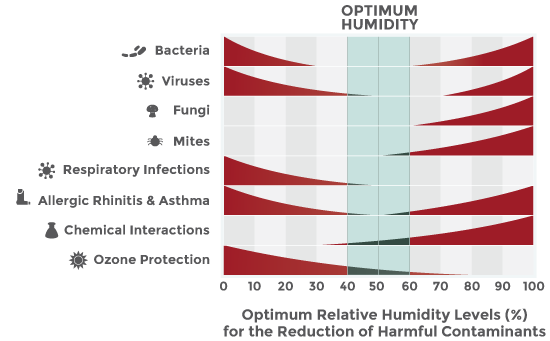 How does humidity effect my choice in HVAC? Too much humidity can create a breeding ground for Bacteria, Mold, and Dust Mites. 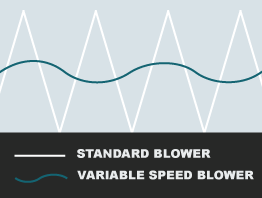 A system with variable speed blower and a thermostat with humidity control. What do I need to know about air quality? Can’t Find Your Question? Send Us a Message Below!